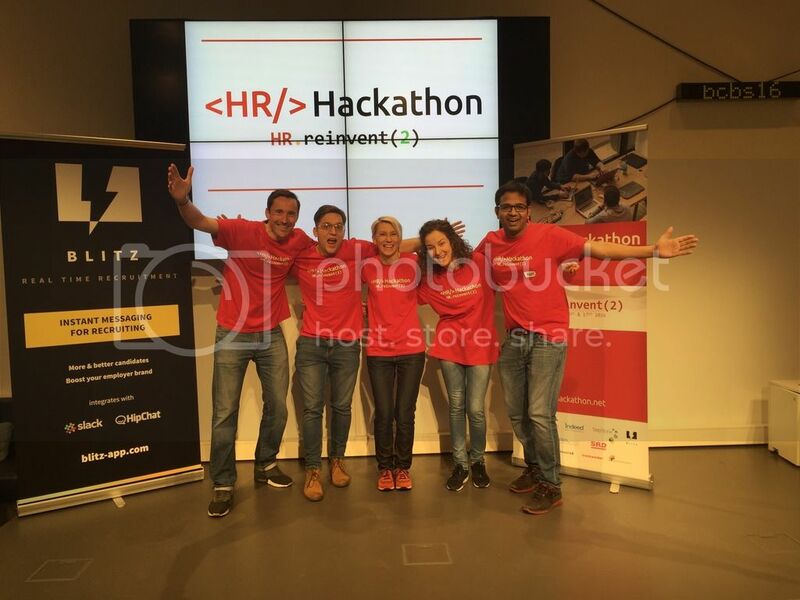 Earlier this month, two members of the Workshape.io founding team took part in the second edition of the HR Hackathon in Berlin. The event took place over two days in the Telefonica BASECAMP, a vibrant co-working space in the heart of Berlin. HR Hackathon is a gathering of 100+ Developers, HR practitioners, Recruiters and Creatives to exchange ideas, form teams and develop prototypes of innovative products that could disrupt the ways of HR. The final goal of the event was not only to come out with some amazing concepts but to prove that HR professionals and Software Developers can collaborate over interesting creations and understand more about each other's area of expertise. At the end of the two days of hacking a jury of 5 would choose 3 winners based on scoring criterias that included solution to a real HR problem, applicability to German market, the use of innovative tech, the completion of an MVP amongst others. 20% - Is the problem real and frequently occurring? 20% - Is the solution validated with users? Was feedback collected and evaluated? 10% - Has a real, innovative and unique technology has been developed? 10% - Is the product finished in the sense of a marketable MVP? 10% - Is there a fit and compliance to the German market? With a large main stage and an open caffetteria, Telefonica BASECAMP is located in Mittelstraße, right in the center of Berlin. And it managed to squeeze in, feed and serve over a hundred professionals passionately hammering their keyboards for two consecutive days of hacking. The walls covered with displays showing the hashtags currently trending in Germany, the venue felt alive and connected on its own challenge: to have the #HRHackathon hashtag to show up as one of Germany's trending topics on the walls, a goal that was reached on the first day of the event - not surprisingly provoking a timed race to capture it on camera! During the first hours of the event, whoever came up with an idea was invited to pitch it on stage and organise a team. Even though there's been some struggle for some teams to gather enough devs to work on their ideas, almost everyone seemed to have manage getting a cross-functional team going. After that, the games were pretty much set, and most people locked in the hacking / prototyping tunnel and worked non-stop on their ideas until later night, to then rush to the end line in the few hours available the morning after. For the ones left with no hacks, or needing a break, there's been lots of tracks spread for the whole two days of the events, both in German and English, mostly regarding HR and recruitment, platforms and tools. Even though it would be great to mention every idea that was thrown on the table, here's a list of the 10 that made it to present in the final pitch the day after. Surprisingly, considering the short time given, most of these came with a fully-function MVP product, and some were even deployed live for everyone to try or submitted to the App Store! Bias. Tracker - A tool used to analyse large quantities of CVs and historical hiring data to spot hiring biases and common patterns in order to help companies avoiding fall in the trap of hiring "clones"
Mojito Challenge - An app that allows creating challenges and assign rewards to its users that can be used for retention and training of employees - in this case, through the delivery of Mojitos! Surprisingly enough, this team managed not only to get an MVP up and running, but to publish a finished iOS app to the App Store in the course of just two days and also push an Android build to Google Play in the few days following the event, along with a nicely designed landing page and a presale campaign. The product solves a real problem of the German industry, by scanning and automating the analysis of employment references - Which in the German market are standardised by law yet not digitalised. During the course of the event, the team even had the time to find potential buyers and pre-register some customers - Well done! Originated and presented by our co-founder Hung Lee, an amazing team effort managed to give birth a prototype of recruiter-bot - It's a very flexible, configurable assistant that can be set to interface you to any data source in a more "human" way, by just talking on a Slack channel. During the event, it was also adapted to assign people to projects depending on their offered skills - not bad! GitRecruit helps recruiters hire on the basis of real-world technical matters. Based on your search query, it will start selecting and showing you a number of developers associated with a code snippet from one of their GitHub repo's. Along with it, part of the app provides access to content that makes it really easy for recruiters to learn some basic common sense rules to apply when evaluating if good practices have been applied in the snippets they are reviewing - Great concept, perfectly fitting an event that tries to bridge developers and recruiters. Not only the whole 2 days of the event has been lots of fun, but the quality of the prototypes and actual finished products came out of it was impressive - it was amazing to watch developers, innovators, founders, HR practicioners and more get together to produce innovative HR Tech in such an intense couple of days. A huge thanks from our parts to Eva Zils and her dream team for getting this organized. 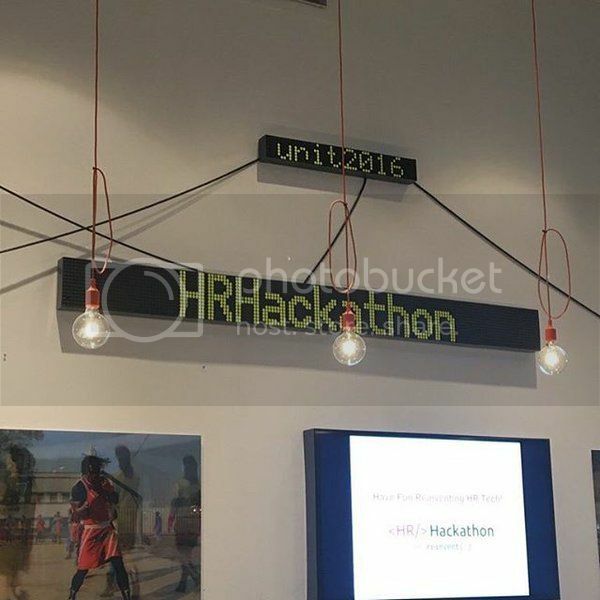 We look forward to supporting your efforts in bringing HR Hackathon to London later this year. More on this shortly!